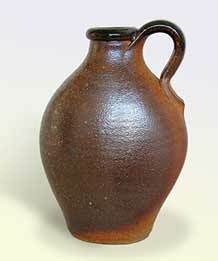 John Leach Jar - 13" (330 mm) high. 1999. Muchelney Pottery was started by John Leach on his return from the USA in 1964. John changed from oil to wood for firing in 1976, and in 1998 built a new wood fired climbing kiln on oriental principles with a capacity of 350 cubic feet. The stoneware produced at Muchelney is glazed on the inside and on the outside shows the beautiful warm flame marks produced by the toasting of the 1300°C firing. Working at the pottery with John are Nick Rees, master potter and Mark Melbourne. The oven-to-table ware is of very high quality, as are the studio pieces produced at the pottery. A new Gallery was built adjacent to the pottery's kitchenware shop in 2003 for signed pots by John Leach, Nick Rees and Mark Melbourne together with John's personal selection of work from his favourite artists and makers. In 2006 John Leach opened an online shop to sell 95 repeat designs from the Muchelney kitchenware range.